Adorn your art and photos in this aqua blue frame, designed by Artist Jane Seymour. 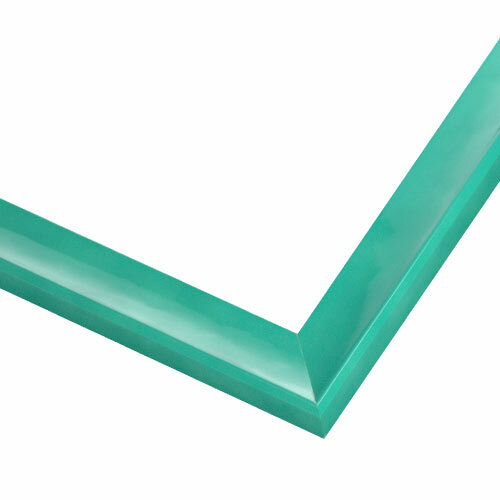 This simple yet elegant frame is finished in a turquoise lacquer. The classic profile makes it the perfect addition to any art or photo, while the soft and alluring mottled texture resembles waves crashing on the shore, adding unexpected interest. Think of this wood picture frame as the finishing touch to your masterpiece: perfect for framing vibrant photography, kids’ art and more. We framed and up lifting scripture quote we received as a Thank You and the picture is now hung in our kitchen. Can I get this frame of it's less than 4 ft tall and wide? BEST ANSWER: Hello! Thank you for considering us for your framing needs. We offer this beautiful frame in size 4"- 36". Please let us know the size of your artwork and we will provide you with a quote. If you have any additional questions, please let us know. Happy Framing!